The holidays are quickly approaching and you're going to be scrambling for the perfect gift for everyone on your list. When I'm buying gifts, I try to get either exactly what the person wants or something that is meaningful or useful for that person. I hate giving gifts that just sort of confirm that I got the person something but don't think they will use it. As a sewer myself, I love getting sewing related items. Whether it's new scissors or new patterns, I'm excited about it. 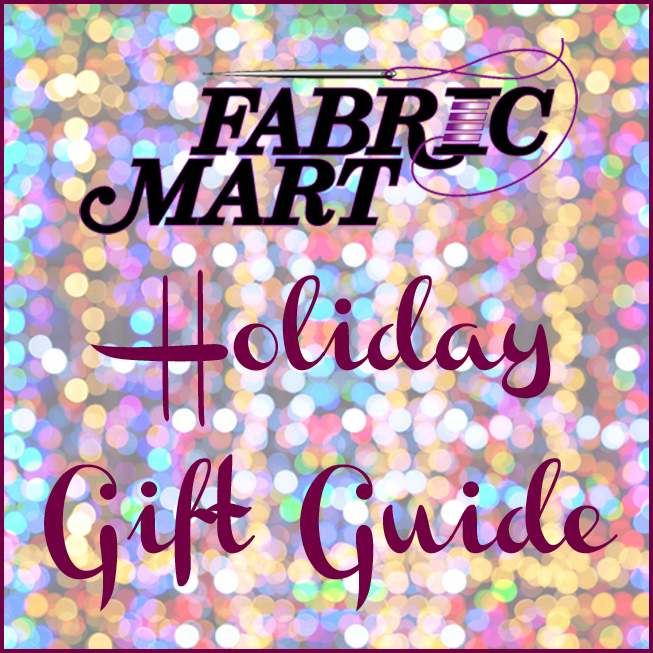 I've come up with a list of five gifts you can get from Fabric Mart for the sewer in your life. 1) Julie's Picks Swatch Club - This is great gift for a new sewer or seasoned seamstress. Many of our of new customers say that it is so helpful and allows them to understand more about fabric. Seasoned seamstresses and newbies alike, also enjoy that you can feel the fabrics before buying them. Learn more about Julie's Picks. 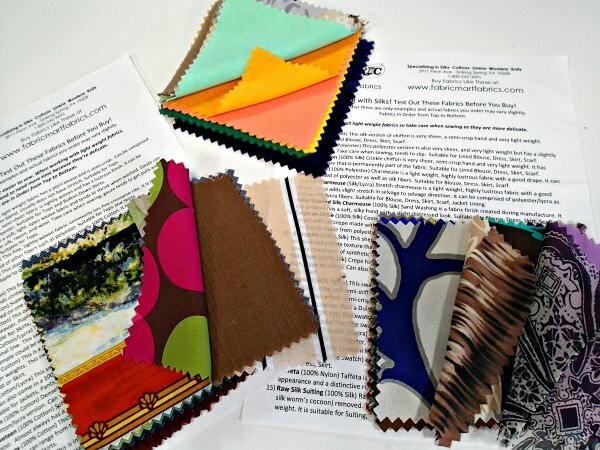 Julie's Picks members receive 30 fabrics to their door every month. Here's another perk -- when you join in the first quarter of the year, you receive a $25 gift certificate with your mailer. (Membership rates and gift certificate are pro-rated quarterly.) This is good toward any fabric purchase on our website. Ready to join? CLICK HERE. This is the perfect stocking stuffer for a new sewer or experienced sewer that would like to learn a little more about fabric. Four different swatch packets are available -- Cotton, Knits, Silks and Wool/Suiting. The swatches are large enough that you can feel the weight of the fabric pretty well and even sew on it. Different weights of fabric are included in each packet highlighting uses and care instructions as well. We are in the process of redesigning the packet to be more of a "book" form. If you order the knit and wool/suiting packet, you will receive the book style packet. If you order the cotton or silk packet, you will receive the first run sheet with swatches attached. Both styles are very useful and include swatches. We just changed the look of our second run of the packets. 3) Sewing Pattern and Fabric Combo - This gift is best from a sewer to a sewer. (I couldn't see my husband picking out fabric to go with a pattern!) Last year, I made up this gift for my mom. She was just getting back into sewing and needed a project that would give her positive results the first time. I picked Pamela's Patterns Pants...Perfected and The Perfect T-shirt. Then I selected a basic pants fabric with stretch and a fabric for the top that could go along with the pants. How cool would this combo pack be for the activewear sewer in your life -- activewear fabrics and patterns! We hand-picked a selection of activewear patterns from Jalie Patterns and continue to keep stock in activewear fabrics. See Jalie Patterns HERE and our activewear fabrics HERE. 4) Sewing Patterns - If you would rather not pick fabric to go along with a pattern, buy a pattern pack. Pick 3-4 patterns from our hand-picked selection of patterns by Independent Pattern Companies. The great thing about these patterns are that all the sizes come in one envelope, so there's no guessing what their size may be. Check out our selection HERE. 5) Gift Certificate - Some people say that a gift certificate is a careless gift. Absolutely not! I actually would love a gift certificate. There are so many places I shop that I wish I had a gift certificate for, especially fabric stores!! They are available in any amount over $10. Buy one now! I hope you've gotten some inspiration from this list of gifts. What sewing related gifts have you gotten or given to another fellow sewer?